This winter we will be constructing temporary separated bicycle facilities on Salzedo Street and University Drive. These temporary facilities will be protected from motorized traffic by 500 pound decorative concrete planters full of beautiful vegetation. This demonstration project will give people the opportunity to feel what it is like to ride a bike in a protected atmosphere and will beautify the area. The City is striving to create the highest quality bike network for all ages and abilities. It will be safe, functional and beautiful. Notice to Proceed was given to Toole Design Group this Fall to design the backbone of the Coral Gables Bicycle Network. Extra wide travel lanes were reduced to ten feet and five foot buffered bike lanes run from Red Road to Anastasia Avenue. Sharrows connect to the bike lanes on Sevilla Avenue to Segovia Street. 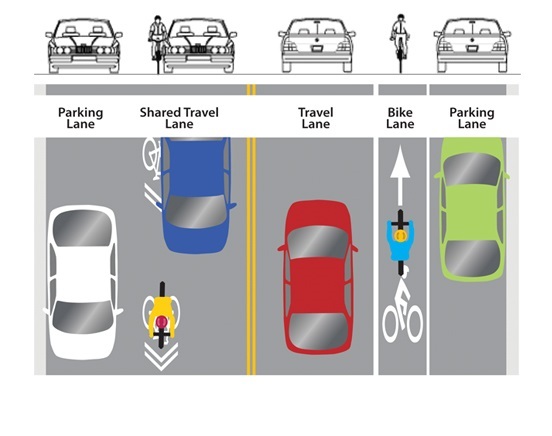 Sharrow is short for "shared lane bicycle marking". This pavement marking indicates that bicyclists are permitted to use the marked lane. What do these sharrow markings mean for motorists? What do these sharrow markings mean for bicyclists? Motorists should always be prepared to share the road, even when there are no sharrow markings or dedicated bike lanes on the road.